PSP Fitness and Sports Instructor Caleb Howitt (third from left) leads a lunchtime Tactical Athlete Conditioning class, which is a new offering from PSP and one of the classes included in the Winter Boot Camp Challenge. As the new year resolutions begin to fade and the February blues start to kick in, keeping up with your fitness routine can be even tougher than usual. For those looking to push themselves and go hard at the gym through the winter, PSP Halifax Fitness and Sports staff are challenging personnel to take part in the Forces in Training: Winter Bootcamp Challenge. The goal is to attend 15 PSP Forces in Training (FIT) class over the next month; those who complete the challenge will get a free Dri-Fit t-shirt, and will also be entered into a draw for a larger grand prize. Credits can be earned by participating in any FIT class, including Yoga, Spin, Force Prep, TRX, Step Aerobics, and others. 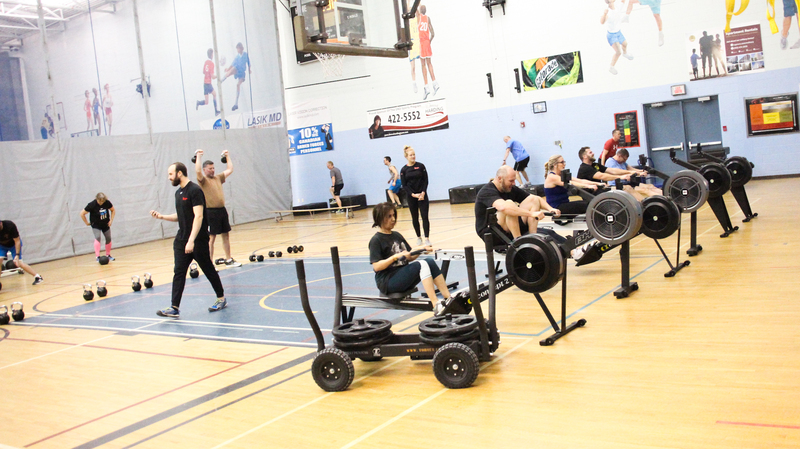 Those looking for an extra challenge are also encouraged to try the new Tactical Athlete Strength and Tactical Athlete Conditioning classes offered at the Fleet Fitness and Sports Centre. The classes incorporate a number of different movements and exercises through the hour, taking a scientific approach to determine the type of training most beneficial for military members. The program is currently running as a six-week trial, and is likely to continue beyond that, introducing new exercises and modalities in the future. “We think of military members as athletes, rather than as bodybuilders, so they need a well-rounded fitness program, rather than a specialization in one area,” said Fitness Coordinator Lucas Hardie.